Amazing the books I run across. This was a delightful find, extremely well written with evocative images and pithy, humor-laden sentences: "My Icelandic was too rudimentary for that. It's a difficult language with an excess of grammar." and "The weather was classic Icelandic: forty degrees and raining sideways." There's also an amusing scene where dual meanings of the Icelandic word for ride can be endowed with sexual connotations. Shades of me growing up and confusing scatology with eschatology. The author, who at the time was teaching at Penn State, and her husband rented a small summer home (really more of a shack) with no electricity or plumbing on the assumption it would be a good place to escape distractions and to write. Not your customary summer home. It was separated from their car, parked at the end of a cow lane, by some kind of estuary. If the tide was in, an hour was required to walk around to get to their car. If not, and a prominent rock was visible, and, to quote their son, they avoided the "sucking mud", they might reach the car in twenty minutes.Brown had studied medieval literature (Beowulf in the original Old English drove me crazy in college) and had a professor who communicated his love of Icelandic myths. That pushed her in the direction of studying Icelandic sagas and the book is filled with links to an old Icelandic tale to illustrate a point she is making. Iceland has an interesting history and given its long winter nights and plenty of lambskin to write on, evolved a strong story telling/writing culture, proud of its independent, kingless, society, especially before the Norwegians took over in 1262. They wrote their sagas in the vernacular prose, unlike Europe where verse dominated.Brown is also somewhat of a horsewoman and was intrigued by the Icelandic horse, a breed carefully isolated from any possibility of being sullied from outside influence. The breed has an interesting mutation that permits five gaits (tolt and pace being the extra two) as opposed to the "normal" three gaits. (Her website has an interesting explanation for the chromosomal differences and whether three or five should be considered normal. (http://nancymariebrown.blogspot.com/2...) Most of the book describes her quest to bring home a couple of these unusual horses. The differences in riding style and requirements between what we consider to be "normal" American riding and Icelandic traditions and training were fascinating.It's a difficult book to classify, part travelogue, part essay, part history, part memoir; but who cares. My only complaint is that you'll want to climb on the next Icelandic Air to check out Iceland and its horses. A great read, especially if you love horses. Except maybe for the part where she discusses why Icelanders eat their horses and why we don't. As with so many things, it has to do with religion (Pope Gregory III) and Norse sagas. Hard to underestimate this book. The author has survived a deep emotional trauma and makes the decision to follow her heart into two of her greatest loves outside of her marriage: The Icelandic horse, and Iceland itself. Unlike some books where the protagonist is air-dropped into another culture with little preparation, Nancy Marie Brown spends as much time in Iceland as she can, and always has. She is in love with the literature and sagas almost to the point of drunkenness, and she can inflict the reader with this giddy delight as she parses and explains nuggets of language, concept, and culture. She has her heart set on a horse, a perfect horse from Iceland. This means living with various peoples and immersing herself among their lives. Despite the fact that she is almost an 'old hand' at visiting Iceland, she still makes mistakes--her hosts refuse her gifts of citrus fruit (too expensive) and that pesky third gender in the language means a faux pas. One of my favorite parts of the book is her attachment to the anti-hero Grettir, whose life story peppers the book. I laughed out loud to learn that when the comic GARFIELD came to Iceland, his name translated to GRETTIR--both are pot-bellied, red-headed, and sour-tempered!These are no ordinary horses, though, and she lists the reasons why this horse is so unique, and so worthy of respect and protection. Listing these reasons are too close to spoilers, as they are one of the richest aspects of the book. End the end, she has to ask herself the hardest question about the Icelandic horse, and in doing it discovers that the 'perfect horse'. Put his one on your 'buy an extra' shelf because you may loan one out without getting it back! I read it because I started riding Icelandic horses. This book did not disappoint. Only now I want to go ride in Iceland. (Note to self - bucket list idea!) Not just about a search for a horse but a nice look at Iceland and some of the mythology of the region. if i knew horses...i would probably have given this book a "5" - happy to have found Nancy as i have now thoroughly enjoyed 3 of her books - might get the 4th book but a copy of INDEPENDENT PEOPLE awaits my perusal. Nancy's struggles with communicating in Icelandic with the human Icelanders was not unlike her struggles learning the nuances of Icelandic Horse. Way Back in the '60s, every summer, grades 8-12, i worked on my uncles farm (as in the book - it was my mom's brother) and every summer it took 2 weeks before i gained a comfort level with the milk cows (the ubiquitous humongous Holstein) - yes, cows - how much more it would have taken to gain a comfort level with the more spirited and intelligent horse - Orville had 4 or 5 horses but i didn't interact with them on a daily basis and not nearly so up close and personal (a horses is an even larger beast). dairy cows have unique personalities - horses much more so, more like people there not being a few you'd like to take a 2x4 to (OK, here i'm thinking more of the cows, especially when they were bulling, cripes). god i miss that, there's nothing quite like the smell of a dairy barn - loved the smell of the horse shed too but hated having to fork out the h.s. - it was dry, the beasts would waste so much hay by dragging it out into the pen and being heavy they could really pack it down - stick a fork in it, pry, and the whole damned floor wanted to lift up - Thor i am not. What a lovely book. I give it a solid 4.5 stars. The author is a scholar of the Icelandic sagas, and I previously read her tale of Gudrid last fall, a book that I also very much liked. In this book, the author leaves home after having suffered violent tragedy in the family, and she sets out for Iceland with the quest of purchasing two Icelandic horses to bring home to the United States. What follows is a journey of one woman's healing and discovery, set in the beautiful landscape of Iceland and the rich interactions with rural Icelandic people. You need not love horses to understand and appreciate this book, as Ms. Brown's passion for the subject sweeps the reader up in it regardless. It was wonderful to read a book about an American seeing Iceland, a country that she clearly loves, without the touristy piece of staying in hostels. Instead, we are taken into the kitchens of the horsemen and horsewomen that she comes to know, and we become privy to their honest conversations. Throughout the book, the author deftly incorporates Icelandic sagas as they pertain to the places she sees and the horses she dreams of. I recommend it to anyone who wants to become temporarily engrossed in a world that is likely quite different from her or his own. Since i am in the process of searching for a horse myself, I found this story to be poignant and true. After all the "must haves" on your list for the perfect horse, it comes down to 'who will be a willing partner with me?" It's almost impossible to know if you are being told the truth as you search - they don't call it horse-trading for nothing and Ms. Brown throws in a lot of excellent Icelandic horse tales to boot. Very good read. I am a horse lover so I was enthralled with this book. It was part travel guide of Iceland and part history of the horses of Iceland. Nancy is in search of the perfect horse(s)(she plans to bring back 2). She initially goes by the color of the horse then learns otherwise. I enjoyed the book immensely . Having been to Iceland, it was interesting to read more about the country and the famous Icelandic horses. Icelandic culture and customs were explained through the eyes of a central PA resident, and she did a nice job of helping American readers understand these customs. Very interesting book about Iceland, touches on some Icelandic sagas. 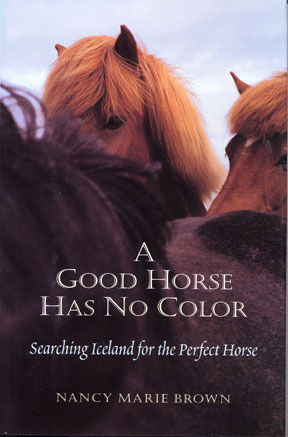 Helpful to know some background on Iceland and Icelandic horses to fully appreciate the content. Definitely give the reader incite on the way of life in Iceland. What a beautiful, interesting book this was. Totally fueled my decision to add a few days in Iceland to my upcoming trip! Very well written book. It held my interest both because of the horses and because I got to learn more about modern Icelandic culture (particularly with regards to horses). Nancy Marie Brown - Nancy Marie Brown is the author of one young adult novel and five general interest books: The Saga of Gudrid the Far-Traveler (2015), Song of the Vikings (2012), The Abacus and the Cross (2010), The Far Traveler (2007), Mendel in the Kitchen (2004), and A Good Horse Has No Color (2001). She writes about Iceland and Vikings, science and sagas. Her books combine extremes: medieval literature and modern archaeology, myths and facts. They ask, What have we overlooked? What have we forgotten? Whose history must not be lost? For 20 years, Nancy worked as a science writer and editor at Penn State University. She now lives in northern Vermont, where she keeps four Icelandic horses and an Icelandic sheepdog, and spends part of each summer in Iceland, offering history and horseback tours in collaboration with America2Iceland.